Written by renowned pinhole photographer Justin Quinnell, this book contains a wealth of fun and engaging activities and projects for teaching and learning about light. Light is a tricky thing to capture, prod and explore. However, thanks to the evolution of our senses, combined with the creativity and wonder within us, we have all we need to discover its mysteries. Discovering Light! makes understanding light and its many uses simple to understand and explore. Light – observing light, close encounters with Captain Photon, shadows, eclipses and invisible light. The eye and vision – experiments with what we can see and how our brains work alongside our eyes to perceive colour, stereo, perspective and time. The Hole – using a small hole to discover the past enabling the measurement of seasons, the microscopic world, eclipses and more. The Lens – how to create several effective camera obscuras from hand held devices to room sized projections using both pinholes and lenses. Non-chemical photography – How to combine photographic materials with digital image capture using cameras and camera phones and scanners to avoid the use of photographic chemistry. Pinhole cameras – how to make and use simple but effective wide-angle pinhole cameras out of discarded materials including a 6 month exposure camera for the price of a cup of tea! The book also comes with a CDROM that contains resources for printing out and using on the whiteboard. Discovering Light! 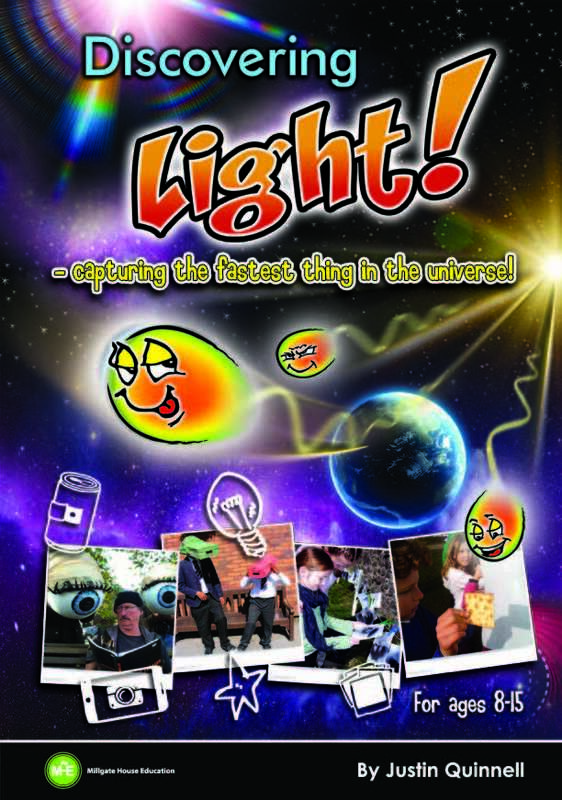 is perfect for teachers, home educators and after school clubs who want to explore the topic of light and have a bit of ‘photon fun’ along the way!